What can you expect on the menu when you go to a traditional German restaurant or pub? More often than not, classic dishes like Wiener Schnitzel, Würstchen mit Sauerkraut, and, of course, potato-based dishes in various forms, like in Bratkartoffeln (Roasted Potatoes), Pommes Frites (French Fries), or Kartoffelauflauf (potato cassseroles). But have you tried Kalbshaxe (Veal Shank), Pinkel mit Grünkohl (blood sausage with kale), Leberkäse (loaf of finely minced pork sausage) or Maultaschen (German-Style Ravioli)? Broaden your knowledge of the traditional German menu with our collection of German restaurant dishes. Germans love their indigenous 200+ types of Kartoffeln (potatoes). In Munich, you can even visit the Kartoffelmuseum. Restaurants serve boiled peeled potatoes with dill and quark. If they are tossed in butter they are also known as Schwenkkartoffeln (tossed potatoes) or Butterkartoffeln (buttered potatoes). The German generic term for baked “casserole” is “Auflauf” (lit. : piling up). A French delicacy, adopted to German taste. Made with mashed potatoes, eggs, salt and pepper, piped into rose-leaf shapes and baked in the oven. Diced potatoes with onions and ham, browned in a skillet and covered with beaten eggs. French fries usually called just Pommes. In Germany, French fries are generally eaten with mayonnaise but are also eaten with ketchup like in the US. Pommes rot-weiß means fries covered in both ketchup and mayonnaise. Bratkartoffeln are raw or cooked potatoes fried with bacon and onion, often seasoned with salt, pepper, marjoram or caraway seed. Bratkartoffeln are served as a side dish with many types of entrees and also make a good breakfast dish when served with scrambled eggs (Rühreier). They are similar to what Americans might call “home fries”. Germknödel are similar to Dampfnudeln except that they are boiled in salted water or steamed over hot water. They are filled with Pflaumenmus (plum jam) and garnished with melted butter or vanilla sauce. These are small dumplings made with Grieß (semolina), milk, eggs and butter. They are usually added to soups but can also be eaten as a side dish topped with cheese and butter or fruits. While this means “false hare/rabbit”, the dish is actually a meat loaf (Hackbraten) that is made with ground pork and beef, breadcrumbs, eggs, salt and pepper. It is served with potatoes and gravy. Sometimes a boiled egg is placed in the center of the meat mixture so that it makes a nice surprise when you cut the meatloaf. Holsteiner Schnitzel, a veal fillet (pork can be used instead) breaded and browned in butter and topped with a fried egg and an anchovy was the favorite meal of the great 19th-century Prussian diplomat Friedrich von Holstein – who liked to eat in a hurry – so he had his appetizer and main course all on one plate. Smoked pork chops. Kassler does not come from the city of Kassel but was named after a butcher from Berlin by the name of Cassel at the end of the 19th century. They are served with sauerkraut and/ or mashed potatoes. These are meat dumplings in a white sauce with capers. The are a specialty from Königsberg which was the capital of East Prussia. They are made with a mixture of minced veal, beef and pork mixed with herrings or anchovies, onions, egg and seasonings and cooked in hot water. The water used for cooking the dumplings is then used to make a sauce with flour, cream, anchovies and capers. The meal is then usually served with potatoes or rice. Although the translation of this is “liver cheese” this Bavarian specialty does not contain either liver or cheese. It is a meatloaf made with lean pork and beef, onions and marjoram. Other words for Leberkäse are Fleischkäse and Fleischlaib. It is eaten warm, spread with mustard in a Semmel (bread roll) and is often topped with a fried egg and accompanied by potato salad. Leberknödel are liver dumplings made with beef liver, onions and marjoram. They are traditional all over Germany but particularly in Bavaria and Rhineland Palatinate (Pfalz). In Bavaria large-sized Leberknödel are eaten usually in a broth, which is served as a main meal. In the Pfalz region they are served with Sauerkraut or mashed potato. A vegetable dish served as a side dish. It consists of young peas, carrots, asparagus and morels. Often green beans, cauliflower and kohlrabi are added, too. A classic Leipziger Allerlei also contains crab meat and is made with a crab butter. Mashed potatoes are also known as Stampfkartoffel, Kartoffelpüree, or Kartoffelmus. It is made by mashing boiled potatoes. Other ingredients such as milk, cream, butter, vegetable oil, garlic, cheese, bacon bits or sour cream are often added. This is a generic term for a meat ball made from pork or beef or a combination of both. The words Buletten (Berlin), Klopse (Eastern Prussia), Fleischpflanzerl and Fleischküchle (Bavaria) are also used. They are fried and eaten hot although they also taste delicious when cold. Potatoes are boiled in their skins and served with butter and/or Quark. Plum dumplings are made by covering a large blue plum (Zwetschge) with a potato dumpling mix. This is then cooked in boiling water and browned in melted butter and either garnished with fried breadcrumbs or sprinkled with confectioner’s sugar or cinnamon sugar. This is also known as Eisbein. It is the German name for a culinary dish involving the lower part of hams hocks. It is also known as Hachse, Hechse, Haxe, Hämsche, Bötel or Stelze. These dumplings are made with raw, grated or cooked potatoes. 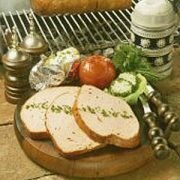 Some are also made with both, such as in the case of specialties such as Thüringer Klößen and Sonneberger Klößen. Kartoffelknödel are served with a variety of entrées and can also be eaten served with fruit sauce or jam. It is a gratin made with layers of potatoes, bacon cream and/or eggs and cheese then baked in the oven. Also known as Reibekuchen, these are potato cakes made of grated potato which are then fried golden brown and usually served with apple sauce. In southern Germany potato salad is made with oil, vinegar and meat broth. Onions, chopped bacon and diced gherkins are also added and the salad is served warm or at room temperature. This version is what Americans call “German potato salad.”In northern Germany potato salad is, however, made with mayonnaise and diced gherkins, hard boiled eggs and apples are often added. The main component of these dumplings is Quark, a type of unripened cured cheese which is like a mixture of ricotta cheese and sour cream. After cooking in hot water, these dumplings are rolled in bread crumbs and browned in butter. They are used in both savory and sweet dishes. A very traditional Sunday meal. It consists of slices of beef, seasoned with salt, pepper and mustard rolled around a mixture of gherkins, onions and bacon. The rolls are then braised for about 1 1/2 hours. Sour cream is added to the liquid to make a sauce. In northern and western Germany this dish is served with potatoes and red cabbage. In the south and southeast it is served with dumplings (Knödel) and red cabbage. Gänsebraten is a traditional dish eaten on St. Martin’s Day (Martinsgans) and on Christmas Eve (Weihnachtsgans). It is usually stuffed with apples, chestnuts, onions and plums and served with Rotkohl (red cabbage) and Klöße / Knödel (dumplings). Sauerbraten, which means “sour roast,” is often called Germany’s National Dish. It is made by marinating a beef roast in a sour-sweet marinade for 2 to 3 days before browning it, then simmering the meat in the marinade for several hours, resulting in a very tender roast and a delicious sauce. Different regions in Germany have different recipes for this dish but Rhineland Sauerbraten is the most famous. It is generally sweeter and contains raisins and gingerbread whereas Swabian Sauerbraten has no sweetening or raisins. Regardless of the ingredients used to make Sauerbraten, the most important ingredient is time. The roast must marinade for three to four days before it is cooked. Sauerbraten is traditionally served with dumplings, boiled potatoes or noodles. In Swabia it is traditionally served with Spätzle. One of Germany’s favourite dishes, currywurst consists of bite size pieces of sausage covered in a tomato-curry sauce. It was invented in Berlin on September 4, 1949 by a snack shop owner called Herta Heuwer grew in popularity over the years. Today more than 800 million Currywurst are eaten by Germans all over the country, particularly in Berlin, which claims to the the “Currywurst Capital” of Germany and where you’ll find the German Currywurst museum. Semmelknödel are a specialty from Southern German, Austrian and Bohemian cuisine. They are made with bread rolls that are at least a day old, which are then soaked in milk.They are usually served with dishes such as Schweinsbraten (Pork roast) or other meats with gravy or mushroom sauce. This is very similar to the Italian Ossobucco. It is a shank (leg) of veal that is slowly braised to produce a succulent meat. Yeast dumplings are made with milk, yeast, salt, sugar and butter poached in a small amount of sweetened milk and butter or salted water and butter. 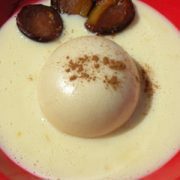 They can be eaten as a main dish served with a sauce, or as a dessert accompanied by vanilla sauce or a fruit sauce. They are also often eaten with potato soup. A savory tart made with onions, cream, eggs and bacon on a yeast bread base. It is a particularly popular dish in wine-growing regions around the time that Federweißer, the young, unfermented wine is available.